Referral letters. Click on the letter graphic on the left to see a few photos and recommendation letters from owners of Carolina Cotons. Click on the photo album image to see more pictures of our beautiful dogs. I just recently added this page as I was starting to get more images on the web site than than most browsers can handle efficiently. Check back often for updated photos! Carolina Cotons is honored to be chosen to represent the breed on the AKC's web site. Click the photo of Bébé on the left to see all the pictures they took of our dogs. The photos on their site enlarge when you click on them. Found a cheap Coton? Stop and read this about puppy mills! Because, you have chosen to purchase a pup at a cut-rate price, you may be sentencing your dog's parents to a life in a cage. Not only that, you are most likely buying a pup that has numerous health and physicals ailments that will cost you more in the long run than buying from a reputable breeder. Please click on the link to your left and think long and hard about what you are doing! Meet our friends, Tom and Katie Rimmer who are from State College, Pa. Two of their Cotons, Star Anise and Scarlet are from our kennel. Click the icon on the left to see their web site. 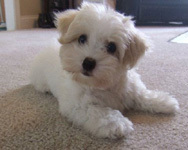 UCARE Coton de Tulear rescue. The purpose of this group is to find loving homes for Cotons in need and to educate the public on the importance of spay/neuter and prevention of animal abuse. Click on UCARE's emblem to see their web site. Click the photo link on the left to our real estate web site for information on the area we live in. Site includes: Pinehurst and Seven Lakes area golf courses; regional information; real estate; lodging; things to do; map links, and more. Come visit our kennel and the famous Pinehurst, NC. Meet Bebe Darling, daughter of our Bogey and Bébé. Her blog spot is new but very informative and will include tips and tidbits that will not only make you laugh at her antics, but will help you to prepare for your own new family member. 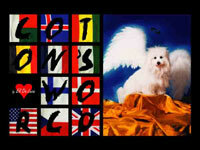 Click the link on the left for a web site that tells you how to buy Eli De Luca's book on Coton de Tulears. Eli is a well-known breeder in Italy. Her kennel is Cotonbrie, and we are proud to say our Bébé, and Charlotte were born there, along with two Cotons that we co-own, and our Rayce's grand parents are from her kennel. Our Bogey's picture is on page 126 of the book, and Bébé's is on page 59, along with our daughter, Brienne. News! I have Eli's books here for sale, come see us and pick up a copy. Click on the link to the left to visit our Shutterfly site for our new litter. The site is packed with useful information and documents for our puppy buyers and is an interactive forum for our buyers to use to post questions.